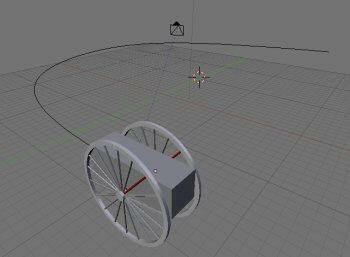 I made a little test scene for using them for controlling wheels when vehicle follows path. When the length of the curve (actual length, not path length) and radius of the wheel are known, the rotation can be calculated based on Speed-curve that controls the vehicle motion. 47.5 is the lenght of the path and 21.1 is perimeter of the wheel. I did not quite understand the logic of the rotation handling of this driver. Rotations are n * 10 degrees, so if I want to rotate object 90 degrees, the script must output 9. Thas why there is 36 in the expression above.